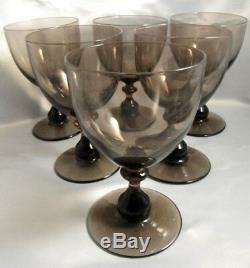 6 Vintage Holmegaard Primula Red Wine Glasses. This rather lovely set is in the design called Primula designed by Jacob Bang for Holmegaard, Denmark in 1930 and produced until 1945. 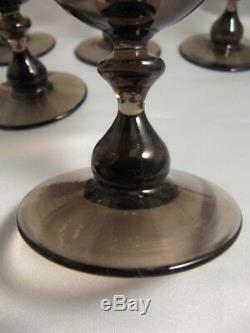 To find a set such as this is quite rare as often only single glasses are found in a pattern such as this. The series was produced with over 100 piece types but sadly not many of these are seen today. The glasses present beautifully and have no damage. The colour is called rogtopas and presents as a deep reddish brown sometimes referred to as smoke topaz. 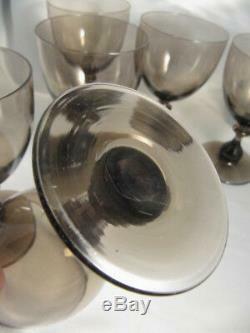 The glasses stand 125mm tall and measure 75mm across the rims. Each glass holds around 200mls. 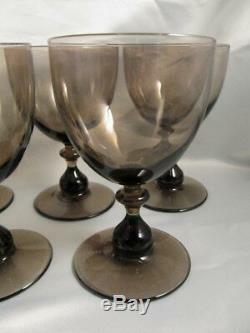 The glasses are the largest wine glass in the series and were produced for red wine. Please note this item is original and not a copy or modern day reproduction. We do not mark merchandise values below value or mark items as "gifts" - US and International government regulations prohibit such behaviour. The item "6 Art Deco Vintage Holmegaard Smoke Topaz Primula Red Wine glasses Jacob Bang" is in sale since Friday, August 10, 2018. This item is in the category "Pottery, Glass\Glass\Crystal\Branded\Other Branded".